Educators who want to demonstrate skill in art teaching take the Praxis Art: Content and Analysis (5135) Exam. The test measures knowledge in several art areas. Several states use the Praxis tests to ensure teachers have the requisite skills to succeed in their specialty area. What’s on the test? What are the best test preparation materials you can buy? We have the answers to those questions and more. 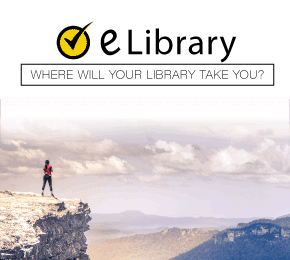 Where can I take the Praxis Art: Content and Analysis (5135) Exam? Praxis uses independent test centers which have hundreds of locations across the country. Candidates can take the test during one of several testing windows throughout the year. Please check the schedule for test dates and times. There are 85 selected response questions that comprise 75 percent of the score. There are also three constructed response questions that account for 25 percent of the test score. One of the constructed response questions is a 15-minute segment testing historical and theoretical art foundations. Two, 10-minute test sections test art making. The test is given via computer. Candidates pay a $146 exam fee. What if I have to cancel my test? 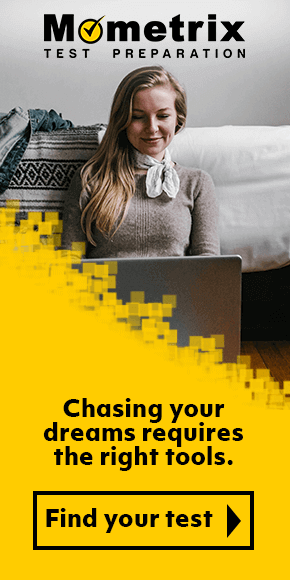 Candidates are eligible for a refund of half (50 percent) of their test fees provided they cancel at least three days before your test date (not including the day of the test). Candidates have two hours to finish the test. 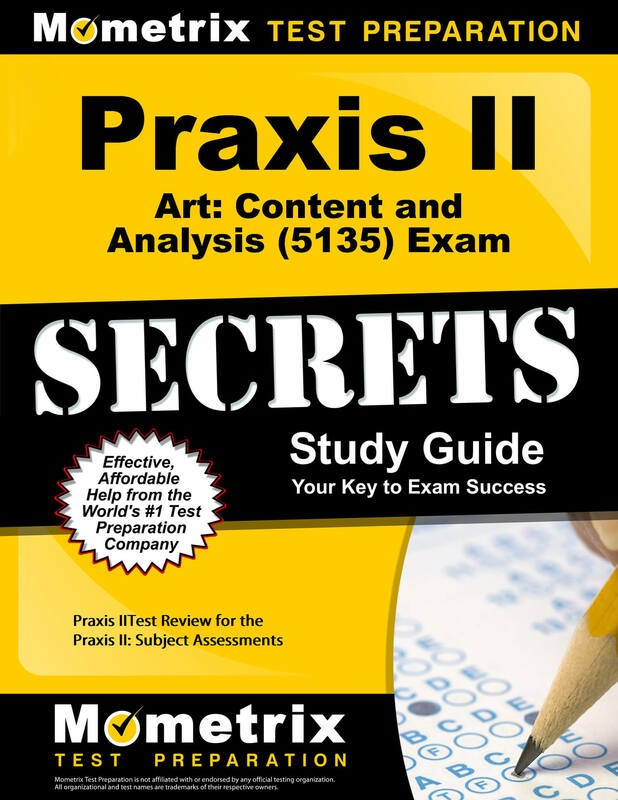 What’s on the Praxis Art: Content and Analysis (5135) Exam? The constructed response questions test knowledge of art analysis. Candidates will create their own answers to specific topics. When will I know if I passed the exam? Some Praxis tests give candidates the opportunity to view an unofficial test score upon exam competition. Official results are generally available between 10 and 16 days after the test date. For tests offered during testing windows, scores are available 10 to 16 business days after the window closes. What is the test passing score? The passing score is set by each state. Check with your local regulatory agency. What identification should I bring on the day of the test? Candidates should bring their test admission ticket along with a government issued ID (driver’s license, for example) that has a current photo and signature. When should I arrive at the test center for the Praxis Art: Content and Analysis (5135) Exam? Please arrive at least 30 minutes early because late-arriving candidates might not be able to take the exam. What are the test center policies regarding personal items? No personal items are allowed in the testing room. That means no electronic devices such as a mobile phone or smartwatch, or most clothing items such as hats, jackets, and scarves. What is the best study preparation materials I can get? 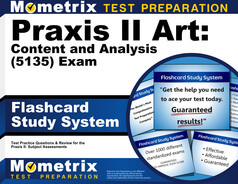 Mometrix has a set of study materials that will help you prepare for the Praxis Art: Content and Analysis (5135) Exam. Our study guide has been written by research team members who are experts in the test-taking field. Because of that knowledge, we’ve been able to craft a study guide that will help you navigate the most difficult portions of the exam. Our flashcard system is just what busy people need. Take the flashcards with you anywhere you go and pull them out whenever you have just a few minutes to review material. These are two excellent study tools. Mometrix Academy is a completely free resource provided by Mometrix Test Preparation. If you find benefit from our efforts here, please consider buying one of our premium quality study guide or flashcard products to take your studying to the next level (just click one of the links below). Your purchase also helps us make even more great, free content for test-takers.